Mechanical equipment erection/installation work is one of WBS elements of Sample Project measurement System for Petrochemical Plant Project Construction. 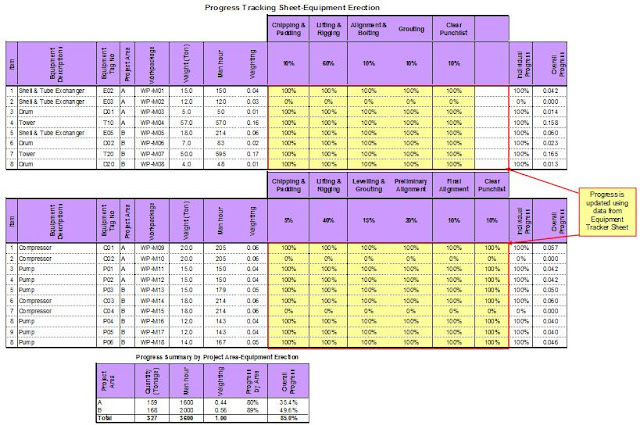 Simple progress tracking sheet for mechanical equipment erection work is built based on the particular work steps and weight factors for the different equipment group. Progress summary for all type of equipments is calculated from man hour weightage and weight progress of each equipment group. You can find the additional resources at Weight factors for Mechanical Equipment Installation. It includes equipment tracker sheet and progress tracking sheet. Equipment tag number, project area, installation status, work packages and quantity (weigh) are listed in equipment erection tracker sheet. Weightage calculation, individual progress, overall progress calculation, progress summary by project area and work packages are included in progress tracking sheet. Format of erection tracker sheet and progress tracking sheet are slightly different from others, for example, The Detail Tracking Sheet for Steel Fabrication which is only made from one type of work steps and percentages. There are two or more type of work steps and weight percentage depending of equipment type for this kind of progress tracking system. The following tracker sheet & calculation sheet are made from work steps such as 1) chipping & padding, 2) lifting and rigging, 3) alignment and bolting, 4) grouting and 5) clear punch list for mechanical static equipments group (column & vessel, shell & tube heat exchanger and tower). For rotating equipments such as pump, compressor and blower, it is made from 1) chipping & padding, 2) lifting and rigging, 3) levelling & grouting, 4) preliminary alignment, 5) final alignment and 6) clear punch list. VLOOKUP function is used to calculate work step progress which are linked from equipment tracker sheet. Individual progress is calculated using SUM PRODUCT function. 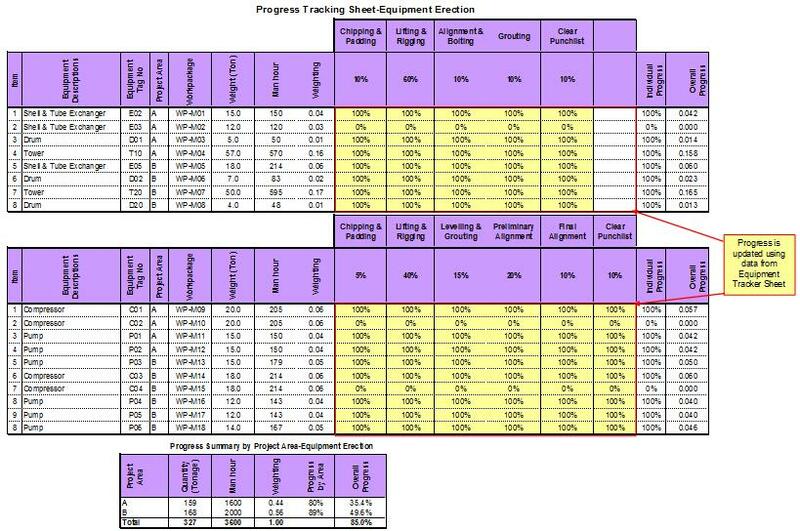 Overall progress of equipment is derived from % of Iindividual progress* Weighting of that particular equipment. See table below. Thanks a lot for the great depth analysis. In petrochemical industry Equipment Erection Progress Tracking system has a great importance.